A recent survey by the Heart, Patio and Barbecue Association found that seven out of 10 home grillers consider themselves to be "better than average" at grilling. 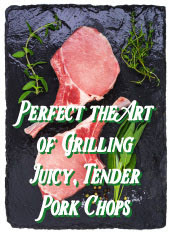 With warmer weather on the horizon, there's no better time to put your skills to the test and perfect the art of pork chops on the grill. An incredibly flavorful, juicy and tender choice, pork chops - with cuts like Porterhouse, Ribeye and New York - are perfect for casual backyard entertaining and easy family dinners alike. For a deliciously sweet and spicy recipe like Sweet Fire Pork Chops, seasoned with hot chipotle chile, zesty orange, garlic and sweet honey - choose 3/4-inch Porterhouse (bone-in loin) chops to create your new favorite masterpiece. For a complete meal, serve them with a side of mashed sweet potatoes and sautéed green beans. 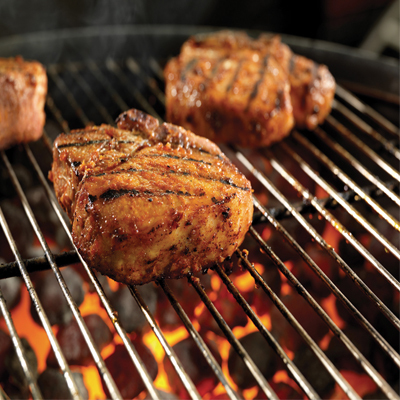 Visit www.PorkBeinspired.com to learn about ways you can win with pork and to find more inspiring recipes that will keep your grill hot all summer long. Prepare a medium-hot fire in grill. Place chops on grill and close lid. Grill over direct heat, turning once, about 4-5 minutes per side, until the internal temperature of the pork on a meat thermometer measures between 145°F (medium rare) and 160°F (medium). During the last 2 minutes, brush chops on both sides with honey. Remove from grill and let rest for 3 minutes.